The gourmet pairings in this spread - from sweet, such as luxury chocolate from Godiva and Ghirardelli, to savory, such as Camembert cheese and premium nuts - are exemplary of fine opulence and generosity. Camembert Cheese, Godiva Milk Chocolate Cashews, Pomegranate Truffles. Veranda Gourmet Gift Basket is a hand delivered gift. These gifts are delivered by one of our local design centers located throughout the United States and Canada. Same day delivery is available for most gifts when ordered before the cutoff time. 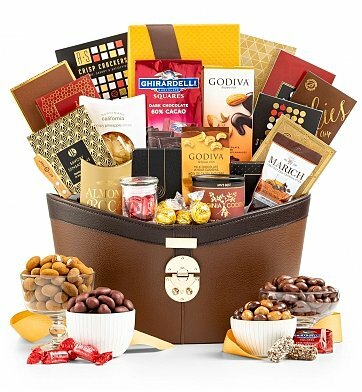 The cutoff time for Veranda Gourmet Gift Basket is 12 PM in the recipient's time zone. With Chocolates and Truffles from Godiva, Ghirardelli and Lindt. Camembert Cheese, Godiva Chocolate Cashews and more. Arrives in a tailored hamper with an attached note card.